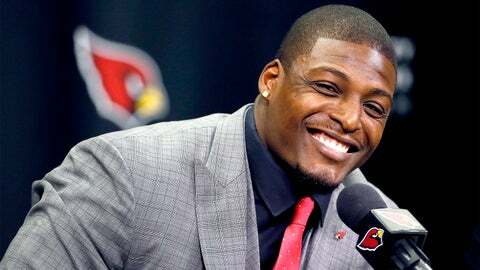 Adrian Wilson signed a one-day contract this offseason to retire as a member of the Arizona Cardinals. Former Arizona Cardinals safety Adrian Wilson is staying busy during retirement life. Wilson has returned to Arizona and is speaking to high school athletes and coaches trying to help build a sense of community. "You start early, the best part about life is growing up," Wilson said Friday at Coaching UP’s inaugural training summit at University of Phoenix Stadium, via The Arizona Republic. "The older you get, you transition into more of a mature mindset, so the more you learn when you’re young, you grow up to make better decisions ultimately." Wilson says the goal of his message is for a community that "would take you under its wing." It is something Wilson never had growing up as a child. Wilson was happy to speak at the summit to high school coaches around the state of Arizona. He wants the coaches to understand that they have the power to change the lives of these student athletes. "I thought it was a great opportunity for me to express to the coaches out here about not just myself, but how student-athletes think and give my perspective on how things can get better," Wilson said. "High school coaches, these guys are the backbone for what high school athletes become as they grow up and those types of relationships, we need to nurture them." Wilson plans to continue to help high school athletes and coaches in the state of Arizona whenever he can. He does not know if coaching is in his future, but will not rule it out saying he doesn’t "box himself in the corner and that it is an option."